When buying a bail bond domain there are certain things to look for and also to look out for. There are scammers out there who prey on unsuspecting business owners. Who owns these bail domain name? At the moment, all domains listed on the Bail Bonds Domains For Sale page are owned by us, BailHound.com. How much are the bail domain names? The buy it now price of all BailHound bail bond domains are displayed on the Bail Domain For Sale purchase page. We’ve made the domain names extremely affordable and priced to sell. While they may not be cheap, they are aggressively priced. The premium domain name prices are already priced to sell… fast. If you were to compare our bail bonds domain names to others, we actually put quality content on the domains to give them a kick-start in terms of indexing. For that reason, the buy-it-now price is not negotiable. How do I buy domain names from BailHound? (If using a check for payment, the check will need to clear PayPal processing prior to moving the domain). How long will it take to get this domain name? You can be the new owner of any of our domains in less than a few minutes. At most it may take 1 to 5 days depending on the move process and which registrar the domain may be moving to. Keeping the domain at NameCheap includes a free push of the domain to your NameCheap account. So, moving a bail bond domain on the same registrar takes seconds. If you decide to move the domain away from NameCheap you will need to purchase a domain credit from your registrar. Example: We use NameCheap as registrars (you just get more for your money here), if you use GoDaddy we’ll walk you through the process of accepting the bail domain. You’ll first need an Authorization Number (EPP Code) from us to begin the process. We will email you this number upon receipt of payment if you inform us of moving the domain to a different registrar. You simply purchase a domain credit from your registrar and inform them the domain is a transfer, input the Authorization Code we give you and wait… it could take anywhere from 1 to 5 days for the transfer to complete. Again, NameCheap has become our preferred registrar. After purchasing a number of domains you will being to automatically receive discounts on future domain purchases. You also receive perks and credits for other online services like Google Adwords credit, photo credits, etc. Where is this domain name I am interested in registered? All of our bail bond domains are registered with NameCheap, one of the world’s largest domain name registrar with over 3 million domain names under management. NameCheap provides excellent customer service. If you want to transfer your new domain name to a different registrar simply ask us for assistance after you have made the purchase. Moving a domain is often a waiting game and depends solely on the registrars involved. Again, it could take 1 to 5 days to move a domain. If the domain will remain on NameCheap the move takes only seconds. We simply “push” the domain to your account. 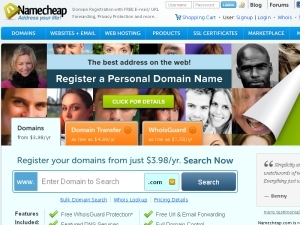 What is included in the price of the domain name? NameCheap can provide you with the details of free membership, but some of the items included in the price of this domain name are email, domain forwarding, URL forwarding and Auto Renew Protection. No additional fees are required to own your domain other than the standard yearly domain name renewal fees which are roughly $10 for most .com extensions. Some domain extensions are more expensive while others like “.info” may be less. What is a “premium domain name” and why are your domains priced the way they are? Premium domain names are high quality, business-oriented domain names that are perfect to use for the identity of a new or existing bail bond company, bail recovery, bail bond school, or other venture. These are hand-picked, best-of-the-best domain names that can quickly become excellent advertising for your firm. What are some of the benefits of owning a premium bail domain name? A premium bail domain name would be your exclusive business address on the Internet forever; no one else will be able to lay claim to your domain. Search Engines, like Google and Bing, pay attention to the keywords in a domain name and will therefore, over time, interpret whatever website is located at this domain name as being the most authoritative site related to the keywords in this particular domain name. This will do wonders for your search engine ranking and will make it much easier for people to find your website. More visitors to your website equals potentially more customers for you. For as long as you own this domain name, you will also receive type-in traffic from potential clients who are looking for the keywords in this domain name and who simply type those keywords into their browser. It has been estimated that as much as 70% of first-time visitors to a website use this method to arrive there. Think of this as an endless supply of qualified business leads that you will receive at no additional charge. What are the benefits of owning a .net, .info, .org or other domain extension? Often the .com extension has been purchased by domain squatters and you may see the domain not in use or loaded with spam links. Owning the other extension will still get you ranked regardless of what some people claim. One only has to look at search engine results to see that some sites that don’t have the .com extension are still ranking. It’s all what you put into it. An added benefit of owning these extensions is using them for your site as intended, buying a competitors domain extension and forwarding the domain to your main domain or using the domain as a landing page to build a client list. Can I speak to someone on the phone about buying a domain name? By all means, call us anytime (347.497.6776) and we will explain the process and maybe even offer a bundled package if you purchase several domains. Sorry. The bail bond lander is simply for example. We may be able to do something for you if there were a bulk domain purchase. Please call for more information. Do you build websites too? We build over a hundred bail bond sites per year and would love to chat with you about the build process for your bail bond company. We are an exclusive bail bonds website design company that does all of our own marketing, programming and design. All sites are optimized upon build so there’s no need to pay anyone for optimization. We use proper schema and as limited code as possible when building. We also do our own copywriting if you find you’re having a tough time writing pages. We build bail bond authority sites! We most certainly do SEO (Search Engine Optimization) and SEM (Search Engine Marketing) for all domains we own. We can also work on your existing company domain. Ready to move forward with the purchase of a great bail bond domain name? You can be the new owner in less than five minutes, and you can pay with Credit Card, Debit Card, Check, or PayPal. If you have any additional questions or concerns about buying a domain name that are not answered above, please call, or send an email by clicking the contact button above. Writer, coder, search engine marketer (und SEO), designer and lover of all things made with strong coffee and care.